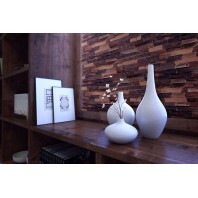 Reconstruct and redesign your wall with 3D solid natural wood panels. Natural wood provides a trendy modern interior design. With its natural colors, shapes and textures, it provides an eco-friendly contemporary touch to any interior design and decor. 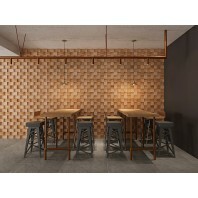 Decorative textured wall panels could turn any existing wall to a contemporary and new stylish design accent. Back of panel provides prefabricated ridges for in prevention for shrinkage and expansions due to weather changes which will NOT alter your overall appearance of your wall. This easy and lightweight application of reclaimed wood panels accent will transform and complete your true own personalized design on almost any solid surface! 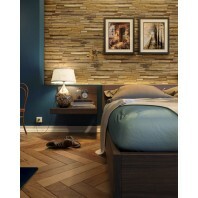 Reconstruct and redesign your wall with 3D solid natural wood panels. Natural wood provides a trendy modern interior design. With its natural colors, shapes and textures, it provides an eco-friendly contemporary touch to any interior design and decor. Decorative textured wall panels could turn any e..